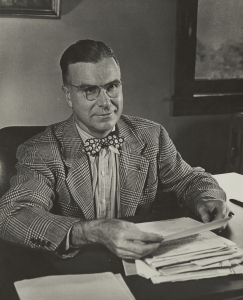 William Pearson Tolley was the seventh Chancellor of Syracuse University, serving from 1942 until 1969. Among many accomplishments, Tolley’s leadership led to the creation of the S.I. Newhouse School, major expansion and increases in enrollment, and dramatic growth in the University’s endowment. Tolley was directly involved with movements to bring World War II veterans home to college campuses after their service and also helped draft the Servicemen’s Readjustment Act of 1944, known in its modern iteration as the G.I. Bill®. In this letter, Chancellor Tolley informed veterans coming home from World War II that Syracuse University was ready to receive them and provide the education they had earned. As thousands of new student veterans made their way to Syracuse, the campus pulled together to accommodate their needs as quickly as possible. This became known as the G.I. Bulge. See the timeline of Syracuse University’s commitment to veterans.